This pair of men’s boots will be sure to help create a renaissance man in you. 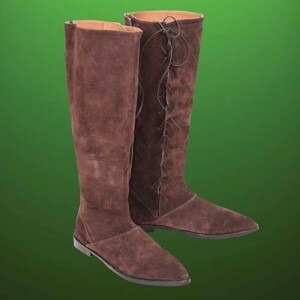 The brown suede generates an authentic appearance. Two large flaps wrap around the side of the boot and are each connected with adjustable ties. Faux leather lines the inside of the boot while the bottom of the shoe has a solid, strong rubber sole to prevent slipping. 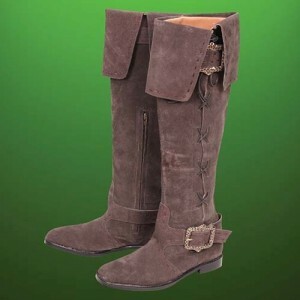 These renaissance boots make for a great addition to any costume. Hi Doug,The white boots are here and are FANTASTIC!!!! They are a perfect fit and look incredible. Now, I can’t wait to get the gold and please go ahead with the silver. I’m trying to stretch out the expense on my credit card so it doesn’t hit me all on one month’s bill. I’d like to get some photos to you in the costume on the horse showing your boots. Wow, fantastic weblog format! How lengthy have you ever been blogging for? you made running a blog look easy. The whole glance of your site is magnificent, as neatly as the content material!